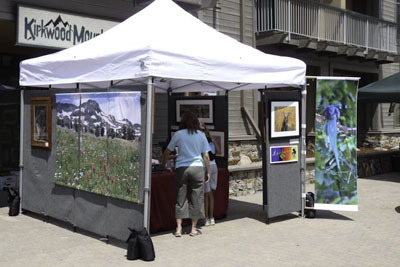 The Wildflower Festival at Kirkwood was a huge success! Plenty of cold brews, wine, and food. We met new friends and fans, many are now collectors of The Jim Stamates Collection! Yea! I showed a new application with the addition of a 3 panel PhotoCoth. You can see it in the photo above. 3 panels make up a large 4 foot by 6 foot image of Round Top and Wildflowers. This is the perfect solution for large walls in a great room or for commercial installations. And it is affordable. Any image from the collection can be made into 3, 4, or 5 panels at any size. I also introduced 6 new images including a couple of my impressionistic style photos that are made in camera. No Photoshop. 5 of the new images sold! I am really excited about that. If you are in Tahoe this weekend I will be at the Showcase Gallery this Sunday 11 am to 4 pm. Stop by and say hi. There are a couple of new things happening at In The Rhythm™ Tours and Workshops. You may have noticed in the Event column above the “Workshop by the Day”. You’ll be hearing more of that very soon. We think it will be way cool, and very popular. Also, if you are interested in Costa Rica February 2010, let me know soon, the first tour is filling fast and there is still room in the second tour.